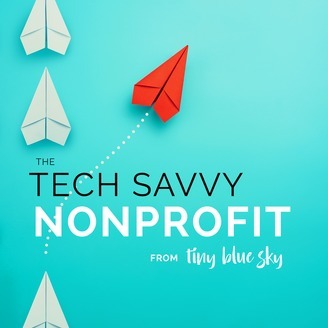 The Tech Savvy Nonprofit podcast explores digital communications in the nonprofit and philanthropy sectors. We’re tech-savvy marketers with deep roots in the charitable sector. As a nonprofit or a foundation, your mission is to serve others. We’re here to explore and share ways technology and digital marketing can help your organization have greater impact. Did you know that your nonprofit organization could get a Google Ad Grant that provides $10,000 every month of in-kind advertising from Google Ads? Imagine the impact! In this episode, we are joined by Google Ads expert and consultant Kristina Cutura. 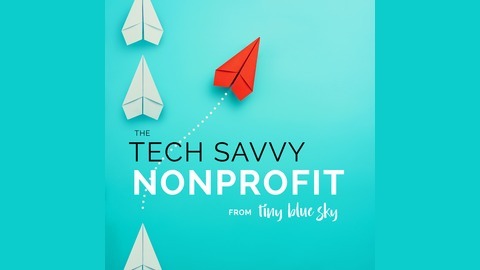 Kristina shares how nonprofits can use Google Ads to further their mission, how to apply for a Google Ad Grant, challenges and successes she's seen with clients that have received the grant and navigating the recent Google Ad Grant policy changes. Kristina worked at Google in 2002 when AdWords was still in its infancy. She was part of Google’s first optimization team formed to help clients understand how to manage and optimize their accounts. Kristina left Google in 2009. During her last few years with the company, she worked mainly in training, teaching internal Googlers and agencies and resellers about AdWords. Google Ads (previously known as Google Adwords) is a way to promote your product or services on Google and other websites that are part of Google’s network. Google allows you to advertise your website on google.com, Google properties such as Google Maps and YouTube, and on its search and display partners. The Google Ads network reaches more than 90% of internet users. The key benefits of Google Ads marketing are reach, relevance and ROI. You can track every aspect of your Google Ads marketing campaign, from the number of ad impressions to the number of clicks and signups, donations, newsletter subscriptions, and more. This level of accountability makes it especially attractive to businesses who have limited marketing budgets. How Can Nonprofit Use Google Ads? When users search for your organization or an organization like yours, do you show up in the search results? When people realize they want or need something, they turn to search. Each search represents an opportunity for nonprofits looking to influence the customer journey. Google Ads allows you to control your message and offer. In addition to asking for donations, many nonprofits have tons of great content they can market through Google. For example, you could promote your free eBook, courses, or other online educational materials to build a relationship. Many nonprofits I work with will offer free content in exchange for email signups, and obtaining that email address give you the chance to start nurturing a lead that could later turn into support or a donation. Google grants $10,000/month in free Google Ads to qualifying nonprofits. The grants allow nonprofits to show ads on google.com. They can not be used to run display campaigns, but many nonprofits set-up a separate account when they are interested in testing outside of the grant limitations. The nonprofit has issues keeping its accounts compliant. Many are so busy they don’t even notice when an account has been suspended. The nonprofit doesn't know how to properly roll out strategy to maximize traffic and fundraising. Kristina recently started working with a nonprofit with an existing Google Ads Grants account. They were spending less than a $1,000/month out of the $10,000 grant and had $0 in donations. In the first month after they started working together, the nonprofit's click through rate jumped up 40%, the spend was up over 600% and they generated over $27,000 in donations. Kristina explained that this isn’t typical—this nonprofit is an established brand that people are looking to donate to, and they were simply underutilizing their potential. In January 2018 Google revised its policies and raised their standards in order to maintain quality ads on Google. Prior to 2018, many nonprofits would use all kinds of general and irrelevant keywords and often ran low-quality campaigns. In an effort to combat that, new management requirements rolled out. Google Grants account violating those policies are suspended. The major one is a 5% click through rate (CTR) threshold nonprofits must meet. If the CTR requirement isn't met for 2 consecutive months, your account will be temporarily deactivated. Geo-targeting has to be specific to where you primarily serve your community. Conversion tracking is required, so you’ll want to make sure to track sign-ups, leads, donation, all relevant actions. There are also some basic account structure requirements, including at least 2 active ad groups per campaign, 2 active ads per ad groups, and at least two site links. As part of Google’s mission-based campaigns policy, nonprofits can no longer use single word keywords or overly generic terms. Keywords with a quality score of 2 or lower have to be removed as well. Google requires all nonprofits to fill out an annual program survey. If your account is suspended, it’s not the end of the world. You can contact Google to request reinstatement after bringing your account into compliance. Currently the owner and founder of a search marketing consulting firm, Kristina Cutura is a pioneer of Google Ads (formerly AdWords). Starting as a Google employee in 2002, she was one of the first three members of the company’s AdWords optimization team, where she developed and tested optimization strategies that are still widely used in the industry. Kristina also created and delivered all optimization-related trainings for internal Google employees, external clients and agencies that manage AdWords accounts. During her tenure, she trained hundreds of Google employees and dozens of resellers, and developed online training resources. In addition to running training programs, she managed and optimized Google’s highest revenue clients. After leaving Google in 2009, Kristina started her own consulting company, KristinaCutura.com, where she is using the skills she acquired at Google to advise a variety of clients on search engine marketing efforts. Kristina has worked with national and global businesses in a variety of industries and sectors, ranging from multi-million dollar corporations to small, family-owned businesses and nonprofits. She is a premier Google Partner and published author. Google Ads Grants application process can be found here. The full ad grants compliance guide can be found here.